Applying categories to maximize your SlideShare presentation views by others is a breeze! After your SlideShare presentation is created and published, you can add many characteristics to your slide deck that will encourage viewers to see your slide. You must download, install and login to SlideShare to create presentations and apply characteristics to your presentation. 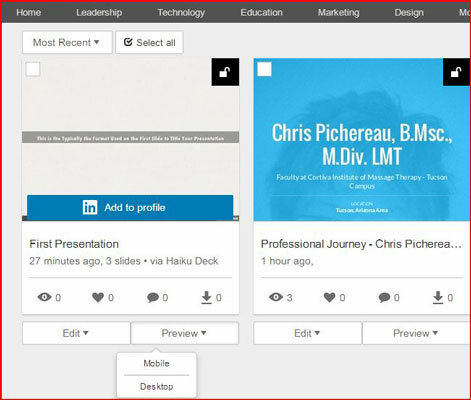 View My Uploads from the SlideShare home screen, choose your presentation and then click Preview. Then choose Mobile or Desktop. Choose the Edit button at the bottom of the screen. Title: Ensure the name of your presentation accurately reflects the content. Description: In this space you are given the opportunity to type up to a 3,000 word description. Tags: Increase your discoverability by up to 30% by typing in keywords that describe your presentation and words that people will use to search for presentations like yours. Separate the keywords in the Tag category by commas. Choose Category: From the drop-down list, choose a category that best describes your presentation. Language: Choose the language in which your presentation was written. Player Background Color: Select that background that illustrates best your presentation. 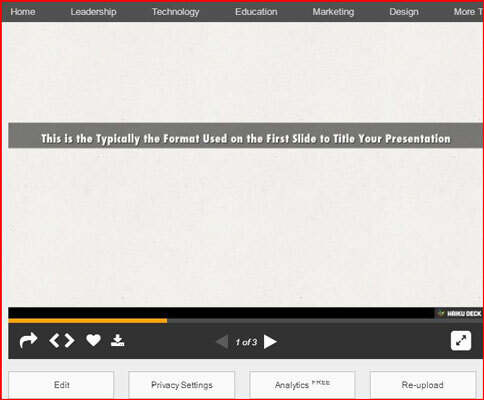 When you apply the background color to your SlideShare presentation, you can preview it before saving. Choose a license: By default you reserve all rights to your presentation, but you can apply other types of licensing to your presentation. Click on the Learn More link under the Choose a license option to see what types of licensing options are available to apply to your SlideShare presentation.